You are here: Home � All Deals , Home: Kitchen Grocery Furnishings � On Sale: Dirt Devil Featherlite Bagged Upright Vacuum Cleaner for $39.99 shipped. On Sale: Dirt Devil Featherlite Bagged Upright Vacuum Cleaner for $39.99 shipped. Amazon.com is selling the Dirt Devil M085590 Featherlite Bagged Upright Vacuum Cleaner for only $39.99 shipped. This well rated vacuum cleaner usually sells for around $59.99. It has microfresh filtration while vacuuming, specializes in edge cleaning, has a headlight, and a 25ft cord for manuverability. 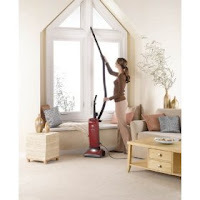 This is a great value for someone looking to get a simple vacuum, that packs a great punch, at an even better price.